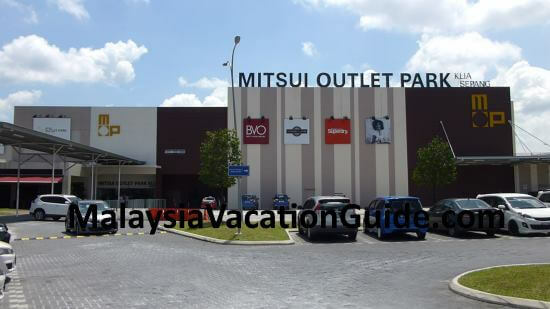 Head to Mitsui Outlet Park KLIA if you have some time to spare before taking your flight at KLIA or KLIA2. There are free buses that are provided for you to come here from both airports. Getting a last minute souvenirs is possible as it takes about 10-20 minutes using the free pick-up shuttle bus to come here. This place is also another option for you to bring your family if you have not being here before. The huge signage that you will not miss as you go to KLIA. With the tagline "Where Luxuries always become Affordable", you can get branded goods at discounted prices throughout the year. 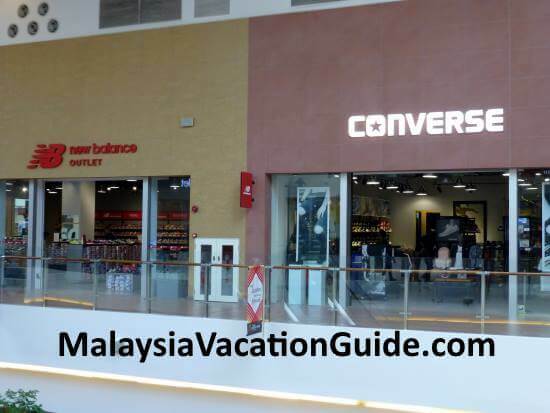 Bags, luggage, shoes, timepieces, jewellery and fashion clothes are sold here from branded outlets such as Pierre Cardin, Hush Puppies, Clarks, Puma, New Balance, Rhythm, Levi's, Cotton:On and BVO. If you are coming from KLIA, wait at the Main Terminal Building by exiting Gate 2, Door 2 at Level 1. The earliest shuttle starts at 8:40am from KLIA and the last shuttle from the Mitsui Outlet Park (MOP) to KLIA is at 11:00pm. If you are coming from KLIA2, the pick-up point is Car Park Bay B9/B10 Level 1, Gateway@KLIA2. The earliest shuttle from KLIA2 is 8:30am and the last shuttle from the MOP is at 11:00pm. From the MOP, the shuttle will reach KLIA2 first followed by KLIA. The shuttle interval is about 20 minutes. Free baggage storage service and flight check-in kiosks for selected flights are also provided here. You can also check the status of your flight by checking the flight information display system. Free WIFI service can be assessed at the Food Court, Flight Check-in Centre, Tropical Plaza and Sunshine Square. 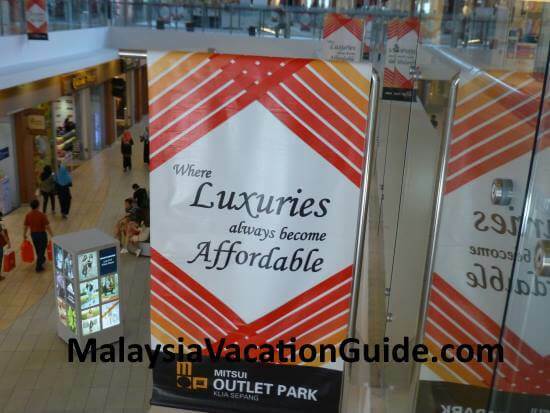 If you are a tourist to Malaysia, you can get additional discounts by applying for the Tourist Privilege Pass at the ground floor information counter. The application is free but remember to bring along your passport for verification purpose. Discounts from 5%-15% are available from most shops. Get the listing of the shops from the information counter. You can also apply for tax refund if you purchase more than RM300 inclusive of GST. Present your passport to the shop staff when you purchase the items. Fill in the GST Refund Form before arriving at the airport. You will also need to keep the original receipt and confirmed air ticket for refund process at the airport. At the airport, go to the GST Customs Refund Verification Counter before checking in to get your refund. You will be asked to show the purchased goods to validate your forms after which you can go to the Approved Refund Agent Office (IRIS Global Blue Logo) to get your refund. Hush Puppies & Tomax outlets are here too. Converse and New Balance shops. If you are hungry, there is a budget foodcourt located at the first floor of the building. Choose your food from the many stalls here serving Western, Korean, Malaysian and Asian food. Prices of food are reasonable. If you have the budget, you can go to higher end restaurants located in the building. 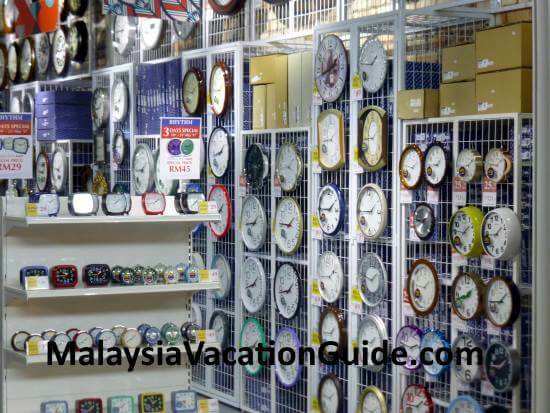 Rhythm shop with plenty of timepieces to choose from. 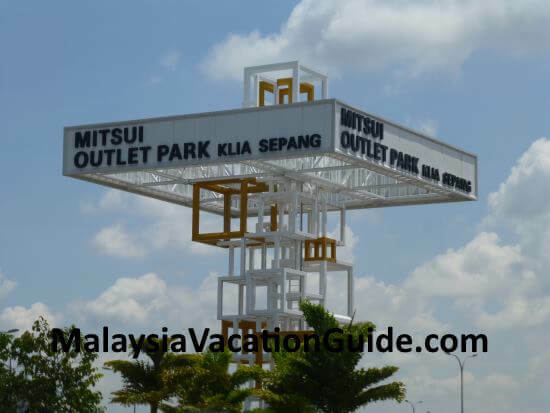 The Mitsue Outlet Park is open from 10am to 10pm daily. 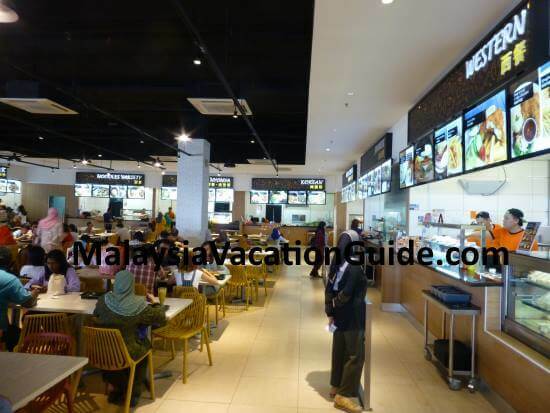 Address: Mitsui Outlet Park KLIA Sepang, Persiaran Kommersial, 64000 KLIA, Sepang, Selangor Darul Ehsan. Plenty of parking bays here. 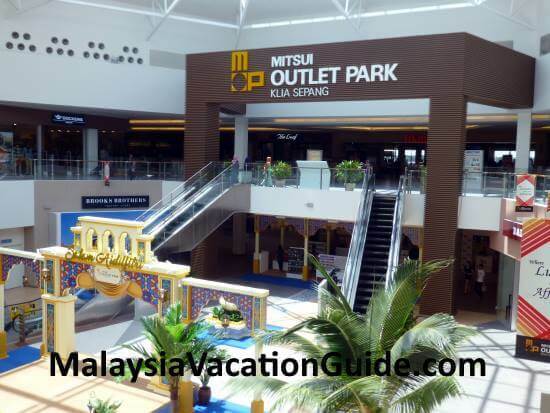 If you like this place, you may also like Johor Premium Outlets which is located in the state of Johor.